Removing stumps is always a messy job. There are two methods in stump removal. One is to completely unearth a stump and the other one is to grind the stump. Unearthing a stump means completely removing the stump including the main roots. This method will cause a huge disturbance to the ground. It might be helpful for you to know that the roots are far longer than a tree's diameter. Studies show that the ratio of root radius compared to the trunk diameter is around 76 to 2, for example, a 7” diameter trunk could have a root radius of about 22 feet. 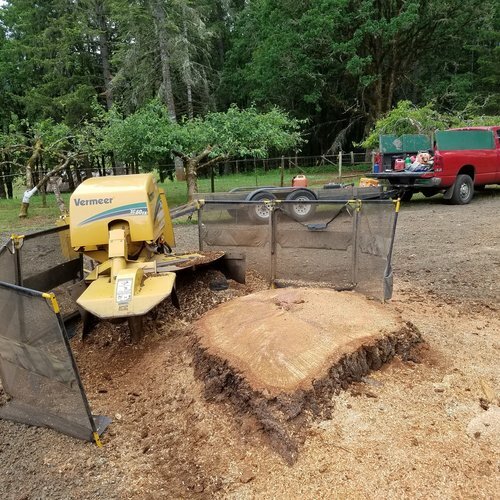 What we do is first cut the main roots (the root radius closest to the tree) and depending on the size of the stump, we may need to use heavy equipment to pull the stump out of the dirt. This process is much messier compared to stump grinding and more of the landscape is disturbed. 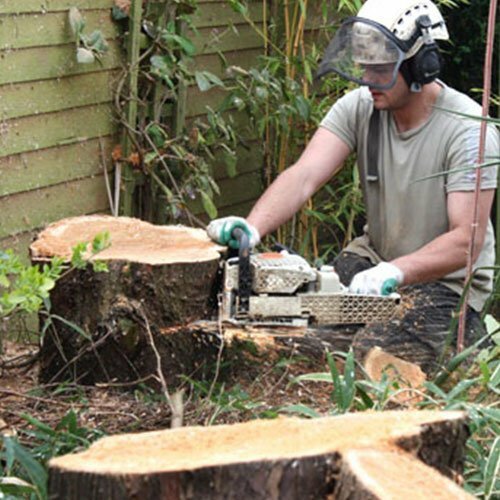 Due to this reason, many homeowners choose stump grinding instead. At O’Brien’s Tree Service Cincinnati, as part of our commitment towards customer satisfaction, we clean off the wood chips produced during stump grinding. For this kind of job, we will need to use a stump grinder. 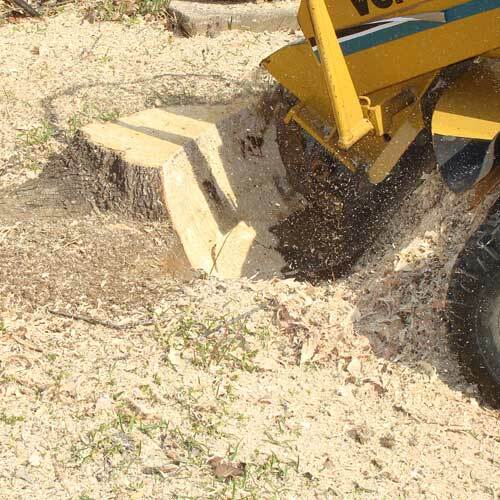 A stump grinder has rotating discs upfront and underneath it. The front disc is used to grind the visible, upper portion of the stump and the disc underneath is used to grind through below the surface in order to finish the job. We position the grinder where it could most sufficiently perform its job and because of minimal impact to your landscape. Stumps vary in terms of size and type, which is why some stumps are more difficult to remove than others. For example, stumps from Cedar trees are easier to remove than from deciduous trees because their roots are wide, flat, and shallow. Some trees have roots that run long and deep such as Oaks and Maples. We must also look at the size and age of the trees to determine the difficulty levels of the job. First, we use chainsaws to level the stump as near to the earth as possible. Secondly, we use shovels to clear away as much of the dirt and stones around the tree stumps. Next is the real deal, we position the grinder upon the tree stump, carefully moving the blades from side to side, slowly grinding away the stump. We continue to do this process until the grinder is about 3"-6" below the ground. We repeat this process until all sides of the stump have completely disintegrated. The grinding will cause some damage to the ground around the stump. We will repair the damage as much as we can and we’ll also clean up the wood chips that spread around the stump. We can even plant some grass seeds on the damaged area to allow a complete cover-up. Basically, the main goal is to cover up any signs that a tree was ever in that spot in your yard. Your yard would be completely free of that unwanted tree and stump but it would be as though we were never there.